This free English course will teach you about English collocations and how they are used. You will first study common English verb-noun phrases and improve your English vocabulary. You will then complete test questions, listen to native speakers, and learn how to use verbs such as 'do' and 'like' in positive and negative English sentences. You will also study different functions in the English Present tense and learn to ask questions correctly. What is a collocation? Collocations are words that go together to make phrases, specifically verb-noun phrases such as 'read books' and 'wear shoes'. In this free English grammar course, you will learn how to use the auxiliary verbs 'Do' and Don't' correctly, as well as how to use the Present simple to talk about things that are always true, routines, and habits. You will then learn how to use the conjunctions 'and', 'but' and 'or' in English sentences. Next, you will learn the rules for using the suffixes 's', 'es', and 'ies' and study the correct usage of the English auxiliary verb 'have'. You will learn how to tell the time correctly in English as well as write them in the correct form. This course will also teach you the correct prepositions to use for telling the day, the part of the day, and the hour in English. You will also learn how to express that you like and don't like different things. 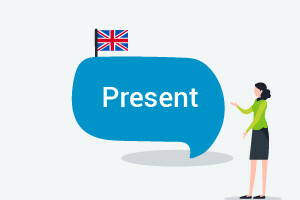 By the end of this free online English course, elementary level English learners will be able to use the correct form of the present simple tense, talk about the things you own, and speak about your likes and dislikes. This will be really helpful for getting your English conversations going. The interactive learning content and audio recordings by native speakers - which you can access anytime, anywhere - will further develop your reading and listening skills. So why wait? Improve your English, today! Define Collocations and how they are used. List some common verb-noun phrases. Explain how to improve your vocabulary. Describe how to use verbs such as 'do' and 'like' in positive and negative sentences. Justify how to ask questions and give answers correctly. Prove how conjunctions are used in sentences to do with habits or routines. Relate how suffixes are used with words in different Present simple statements. Review how to say different times properly in English. State different phrases and sentences that can be used for liking and disliking something.